Social media isn’t just tweeting, posting status updates on Facebook and keeping up with high school friends you no longer talk to in person. With social media, you can score deals, discounts and freebies just by being in the loop. Bet you didn’t know you could even land a deal on a rental car, did you? Surprisingly, most business travelers aren’t even aware that rental car companies use social media, according to a survey conducted by USA TODAY that asked more than 100 business travelers. It would be smart to start following these companies, though, as they oftentimes offer weekly deals and discounts via social media. 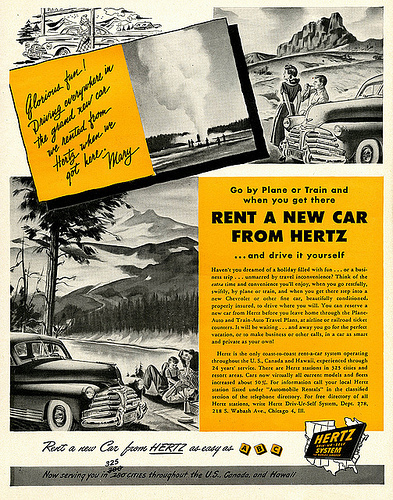 Based on a report by Unmetric, a company that helps brands establish benchmarks for their social media activities, Hertz and Enterprise are two of the best rental car companies making use of social media. 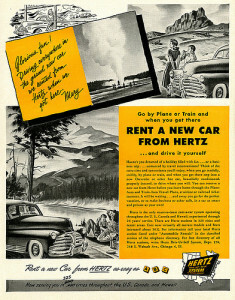 Hertz does the best with Twitter and YouTube, whereas Enterprise has made their marking on Facebook. What does that mean for travelers? If you’re a frequent traveler, it would suit you well to follow a few rental car companies on social media. Rental car companies frequently post coupons on their social media pages and have even been known to give away cars. If you don’t have a Twitter or LinkedIn account, that’s OK. Simply “like” your favorite car companies Facebook pages and you should be kept current with deals, discounts and more. Social media doesn’t just benefit the customers; it benefits the rental car companies, as well. Rental car companies can grow their business via social media, interact with customers, respond to feedback (both positive and negative), and handle complaints and more. They can work social media into their marketing plan and develop strategies to both grow and enhance their business. To use social media, rental car companies should have a Facebook page, website and/or blog, Twitter account, LinkedIn profile (LinkedIn is great for business professionals, i.e. travelers), Google+ page and even Instagram. The more access you have to social media, the more people you can reach. Making a name for your business in the social media world is crucial. No longer do customers call “1-800” numbers to file a complaint or give a rave review. Instead, customers turn to social media. This is both good news and bad news for rental car companies. The good news is if you get a good review or someone gives recognition to your outstanding customer service, thousands of people will know. The bad news is if you get a bad review or someone complains about poor customer service, thousands of people will know. When using social media, you take the good with the bad. Rental car companies will benefit greatly by maintaining professionalism throughout their social media sites. They should respond to criticisms in a timely manner and try to make it right with the customer. Offering deals on a regular basis is a great way to keep customers coming back for more. Social media is a powerful marketing tool for all businesses, from restaurants and entertainment to hotels and rental cars. About the Author: Sarah Brooks is a freelance writer living in Glendale, AZ. She writes for http://las-vegas.hotelscheap.org on travel and small businesses. I prefer to ask around and see what other peoples experiences are but social media could work well too. You might miss some good companies if you just used social media and nothing else though!